You will learn how to make a toe-up sock with absolutely no seaming that is made to fit your foot perfectly. Please go to Knitty.com and have a copy of the pattern printed off. Also, you must have a gauge swatch done in the yarn of your choice before coming to the class. We'll start by measuring your foot and doing some math calculations. This is where that gauge swatch will come in handy so we can figure out how many stitches you need to cast on. 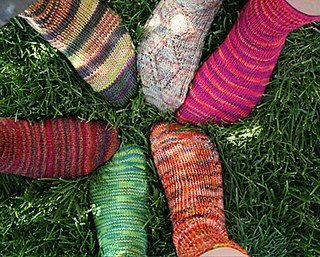 The sock starts with a provisional cast on and short rows, both which you don't need to have experience doing beforehand. Worsted weight yarn of your choice, coordinating knitting needles in 24" circulars and DPNs, cotton scrap yarn for provisional cast on, tape measure, stitch markers, calculator. ?Please bring a gauge swatch (stockinette) that is a firmer fabric rather than looser before the class. $5 registration to save your spot in the class. $30 will be paid to the instructor on the day of the class.